Ice Makers like The Old Days! A long time ago in a land far far away ice makers lasted for the average life of a refrigerator. In modern times their life span has been greatly reduced to about 5 years on average. (Got to love modern marketing technology) So before you sink a bunch of cash into a repair, inspect every part of the ice maker for damage especially the Teflon coated ice mold that is common to break down and corrode. 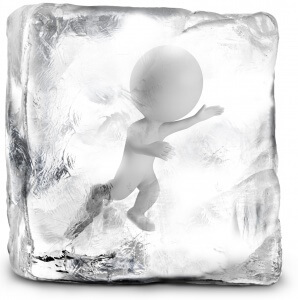 Because ice makers have such a short life expectancy these days, more often than not replacing your ice maker is the most cost effective form of repair. There have been several different ice maker designs over the years; all have the same basic mechanics but some minor diagnostic and mechanical variations. An Ice maker is like a separate appliance within your freezer. On average an ice maker will produce one batch of ice every 1-2 hours. Amazingly the creation of ice begins with water. Hard to believe but yes it’s true. In the old days one had to lift heavy ice trays all the way to the sink, fill them up with water and wait for the water to freeze. It sounds barbaric but that’s what they did! Now it’s all automatic! 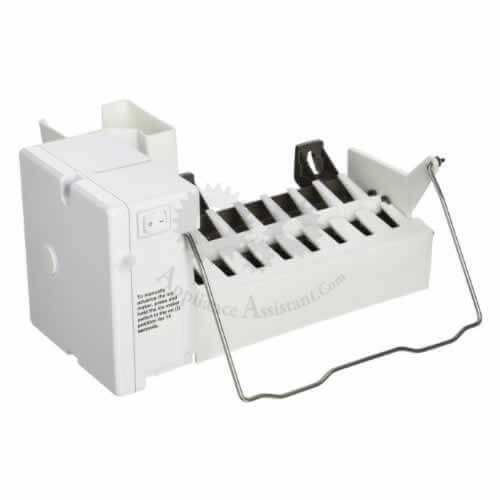 The ice maker temporarily energizes an automatic water valve behind the refrigerator with 120 volts. 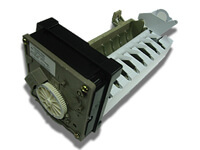 When the solenoid is energized it opens allowing water to flow into the icemaker mold. Some refrigerators have water filtration systems that remove all those pesky contaminants, which is good because for one you don’t want a third eye, and secondly minerals can cause the extremely thin coating on your ice maker’s mold to break down. The mold coating is important because it allows the ice to slip from the mold easily, if it breaks down and becomes rough, the ice will jam in place and you will need to use those plastic ice cubes at your cocktail party. After the ice maker has filled with water we wait. Rushing nature is fine sometimes like when you really want yesterday’s pizza hot now, but removing heat takes a little more time. Once the thermostat senses that the water has frozen it closes a circuit, energizing the motor and heater. As the timer advances the ice sensing arm raises and harvesting arm rotates until it comes in contact with the ice. The motor is unable to move the ice until the heater loosens it from the mold. When the heater has done its job the harvesting arm continues its rotation. After the ice has been removed from the mold the thermostat reopens. The Ice sensing or “bail arm” will now attempt to drop; however, if it is blocked from completely dropping into its neutral “down” position power will not be supplied to the motor and the icemaker will stop production. In this way the ice maker can sense if the ice container is full. 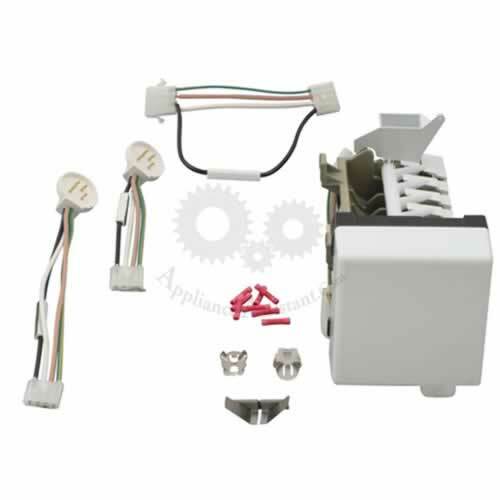 The Ice maker is a fairly simple mechanical device made of six main components. The control module, which contains a small motor, that drives a gear with a conductive pattern on the back, energizing various components at the proper time as it rotates. The harvesting arm removes formed ice cubes. 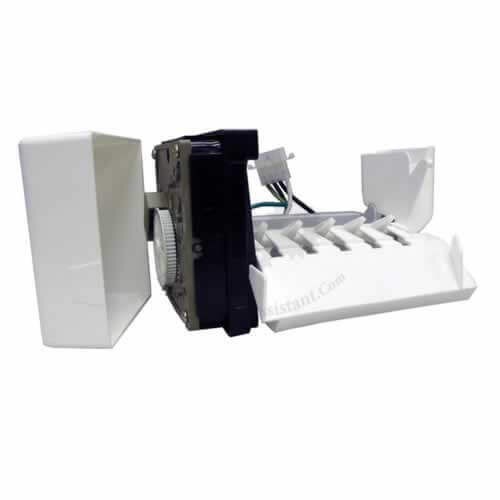 The ice maker thermostat is normally open and closes temporarily when the ice has frozen energizing the mold heater and causing the motor to rotate again. 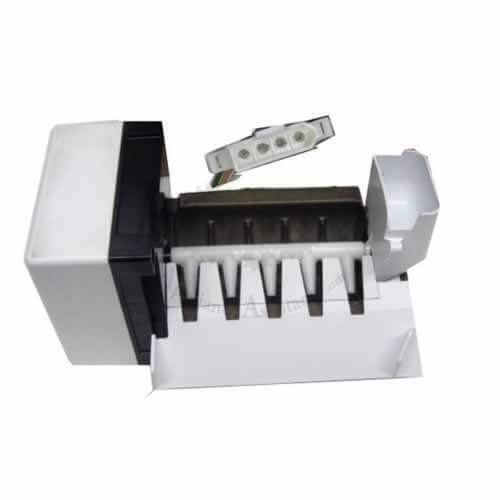 The mold heater warms the mold causing your ice cubes o melt slightly for easy removal. The bail arm opens and closes a small contact inside the control module interrupting power if it senses the ice bin is full. Lastly the water valve supplies the high quality h2O necessary for ice production. Ice makers do not have any kind of a water level sensor like a washing machine does, instead they fill for a set period of time as the rotation of the timer temporarily energizes the water valve. Ice makers are set at the factory for average household water pressure. 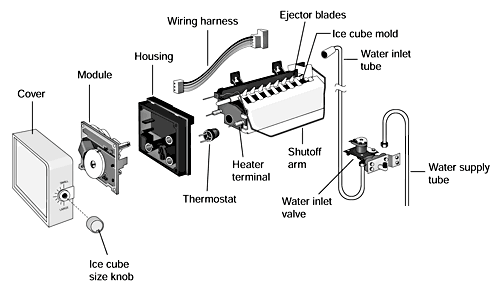 However, if you start to have problems with individual ice cube groups connected along the top, icicles hanging from the icemaker, your ice container floor covered with ice, or small cubes, you can correct the problem by adjusting how long the valve is energized with a screw located on the ice maker module. Adjustment is usually clockwise to reduce fill time and counter clockwise to increase it. Be careful a little goes a long way.